So, I’m sleeping a little more. Not when I should sleep… going back to work after an Easter holiday of staying awake most of the night and sleeping until lunchtime might be fun. I am a little concerned about the sleep time activities though. Sleep texting again. I am sorry, my friends, that I send the most ridiculous messages to you while I sleep. Yes, that is a real conversation I had up there… But people don’t believe you’re sleep texting when you do it in the middle of the day. Amongst the top ten for this week are ‘Jesus didn’t even like fishes’ and ‘I wouldn’t do that naked’… I wish I could remember these dreams, they’d probably keep me amused for days. 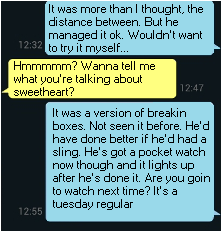 Fits of giggles followed, along with the relaying of the conversation I had with her at 9am this morning. Apparently I sang ‘Happy Birthday’ when she answered (no, it isn’t her birthday) and when she asked what was I was playing at, I told her that it should be her birthday every day, before hanging up on her. I am one of the 33% of people in the UK who suffer from insomnia. Around 5 days out of 7, I find myself awake in the early hours unable to sleep; I average 3 hours sleep a night on those days. When my alarm goes off in the morning, I find myself hitting snooze more often than I should because, once I get to sleep, I would love to stay asleep. It is fair to say I’m not a morning person! While the insomnia is bad enough, worse are the nights I sleep for 5-7 hours and wake up feeling unrested – a sure sign I have been sleepwalking again. On those days I wake up wondering what I’ve been doing during my sleeping hours… for so far the tales vary widely. I have been known to wake up in my car (very worrying) and now, during bouts, my car keys have to be kept safe by one of my children. This doesn’t stop me leaving the house though; I’m yet to find a solution to that. So I wake up and I look for signs… Have my clothes moved? (Yes, I do at least get dressed before wandering, I believe… not been arrested yet) Have I used my phone? Anything else out of place? I have managed to vacuum, work and buy Mocha in my sleep. I put a pile of towels in my car once, and another time I folded up all of my clothes and hid them under my bed. More usual are the sleep talking episodes, when someone stays here with me… I’ll confess my inner thoughts, I’ll talk through my dreams or I’ll talk complete and utter nonsense, and you have no way of telling which! And I also sleep text on a regular basis. Those lucky people… waking up in the early hours to my ramblings… I think I am the reason that most people I know now silence their phones before bed. Again, no way of knowing what I was talking about most of the time. Last night was one of those nights, a sleep texting night. What on earth was I dreaming? Does it mean anything? I have no idea… but I would love to know. I would also love to know where my teaspoons go… I’ve lost 18 in the two years I’ve lived here, and I’m convinced it is a sleep walking issue. So, people of Birmingham, found any teaspoons recently?